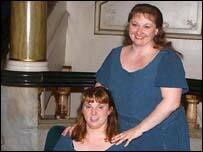 A woman who was born blind and an ex-checkout operator have won a chance to join an opera production by one of Britain's foremost companies. The pair will perform at English National Opera's (ENO) home base, the London Coliseum, after sharing first prize in Channel 4's talent search Operatunity programme. The judges said the standard was sufficiently high for both Denise Leigh and Jane Gilchrist to win. Denise, a 31-year-old mum of three from Audley, near Newcastle-under-Lyme, was seen jointly winning the prize on Tuesday's edition of the show. She said: "I'm utterly gobsmacked, completely overwhelmed." Meanwhile Jane, a 36-year-old mother of four from Chipping Sodbury near Bristol, who is now on a career break from Tesco, said: "I'm totally and utterly in heaven and totally overwhelmed." The pair will share the lead role of Gilda in front of a paying audience next Saturday in an ENO production of Verdi's Rigoletto, conducted by Paul Daniel, who headed the Operatunity judging panel.